Merrell prides itself on making great outdoor shoes, and they have jumped onto the barefoot bandwagon full tilt with a huge selection of shoes designed for the minimalist runner. What the hell does that mean? Well, true minimalist shoes are just that: minimalist. As little underfoot as possible, with lightweight and airy uppers. The Merrell Road Glove is very much unlike either of my other “go-to” shoes (the Yourflex and 730) in that it is zero rise from heel to ball of foot and has no cushioning outside of that provided by the Vibram sole. 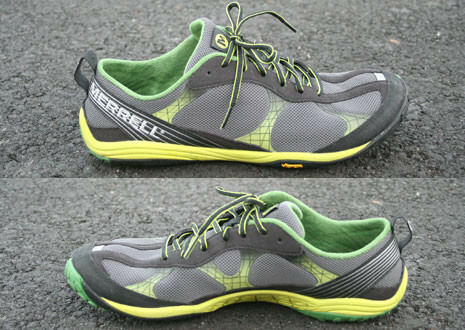 The first thing you’ll notice when you pick up the Merrell is the weight, or the lack of it. This is a light shoe and it damn well SHOULD be. There’s not much to it, which is what I like. The upper is primarily mesh, a very breathable open fabric, strengthened here and there using nubuck and thin, flexible plastic with reflective properties. The interior is soft and open, with a tight heel box and a very wide, open toe box that really lets your feet hunt for grip. These may be called gloves, but they are designed to give you room to spread your forefoot out, which is as it should be. You’ll notice what looks like an arch support built into the shoe, but immediately you can see that really what they’ve done is molded the shoe to fit a human foot, and the “arch support” is just rubber that will allow your arch to flex and properly load as you practice proper barefoot technique. That rubber is a sole made by the company “Vibram” (makers of the odd but popular Five-Fingers shoe) and it is TOUGH. I’ve put nearly a hundred miles of mostly cement use on the shoe (remember I’m 200lbs) and the sole is barely showing wear. The nubs at initial point of contact are slightly worn, but still there. This is impressive, as the sole of my Yourflex shoes began wearing almost immediately, and the 730 has also worn much more. Are there thinner shoes out there? For sure, the sole on this shoe, while lacking in much of any cushioning (there is 4mm EVA midsole separating the vibram rubber from your foot) is thicker than some other choices, but the feel is there. I ran the Subaru/Merrell Down & Dirty Obstacle race in Folsom in these shoes and you feel every rock, every root, every rut. You do not want to start barefoot style in these shoes if you’ve never tried it before, you will probably hurt yourself. Start with a transition shoe and move to the Road Glove later, you’ll be glad you did. Downs? Sure, there’s a few. The shoe is expensive, ridiculously so in my opinion for such a minimalist shoe. They were $115 at REI, but online you can get them as cheap as $89 from Amazon.com depending on the color. And as mentioned, the sole is barely there so you will feel absolutely everything underfoot. For barefooters this is a positive rather than a negative, but if you regularly run a whole lot of trails there are other zero rise options out there that have a little big more in the way of bruise protection. That being said, my 10k run through the Folsom trail system resulted in zero bruises and one very small blister that I blame on my foot being covered in mud and water for most of the run.